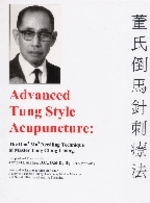 Tung Style Acupuncture, was first made available in English a translations of Master Tung Ching-Chang's work in the mid- to late 1900's. As a system, it uses points different from those found in most present-day TCM acupuncture texts, and is purported to predate the Huang Di Nei Jing, having been passed down through teacher-student lineage for untold generations. While many of the Tung points are found on the twelve regular channels, they are in locations distinct from the 360+ points presented in modern TCM acupuncture texts. They are also largely distinct from the miscellaneous "extra" or "non-channel" points described in most contemporary TCM acupuncture texts. The Tung Style Acupuncture points chosen for the treatment of any given malady are located mostly on the extremities and at a distance from the site of the lesion or pathology. Furthermore, the number of points required to successfully ameliorate any given ailment is fewer than that required in most current TCM acupuncture texts to treat the same malady. Tung Style Acupuncture does not necessitate the use of the diagnostic methods or terminology adopted by contemporary, herbalist-driven TCM acupuncture. Furthermore, the clinical results obtained using the Tung style often far surpass those achieved through the use of TCM acupuncture, especially in the West. This book will be of particular utility to clinicians who have already famililarized themselves with Master Tong's acupuncture and who are interested to augment their practice and success rate using these well-founded techniques.